Two 1918 documents relating to the National War Savings and Thrift Stamps effort at the local level at Rumford, Maine. The alternative to a town meeting on June 28th under call from the President of the United States and the Governor of Maine and the disgrace attendant on a failure on the part of your town to make good its quota is an immediate voluntary subscription of $105,995.78. 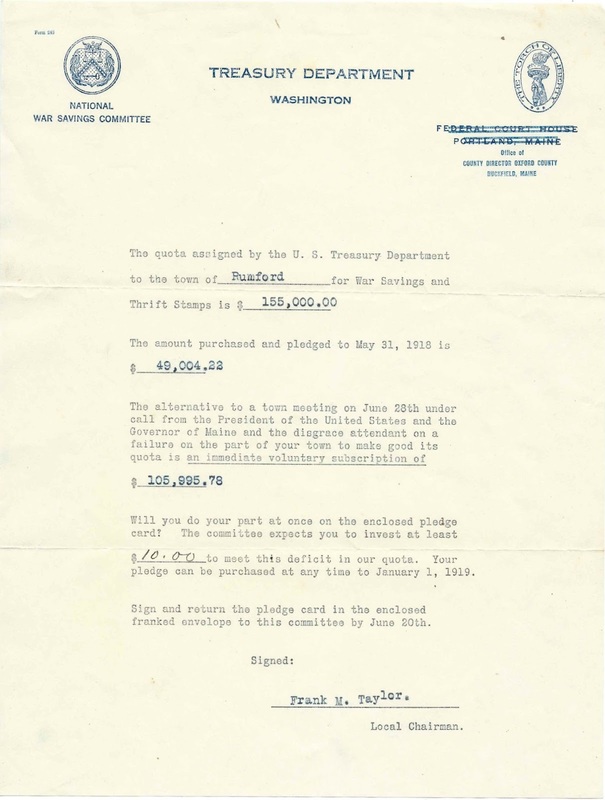 The document was signed by National War Savings Committee Local Chairman Frank M. Taylor and appears to be one of many copies, accompanied by pledge cards, sent or hand-delivered to Rumford residents. 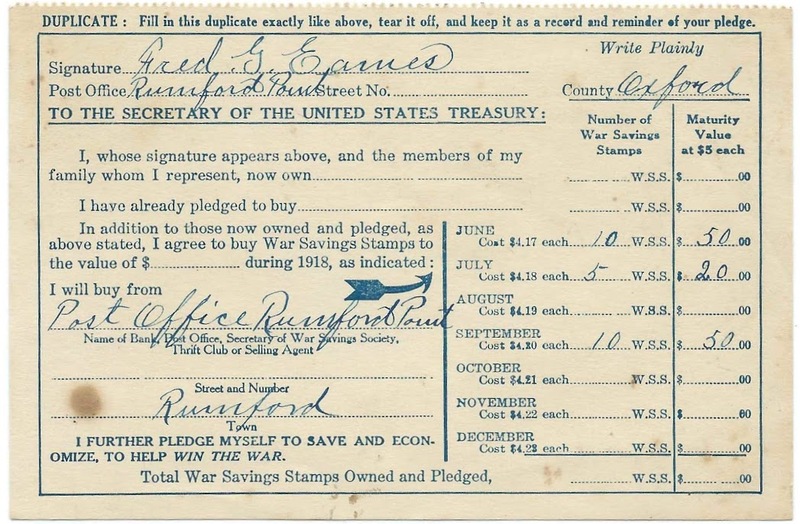 Recipient Fred G. Eames completed the pledge card below. Frank Moors Taylor was born October 7, 1880 at Carbonear, Newfoundland, the son of Archibald and Laura (Moors) Taylor. He became a naturalized citizen of the United States in 1906 when he was living at 653 Crescent Street, Rumford Falls, Maine. By then he had married Grace E. Cross, daughter of Tallerand and Nellie (Coburn) Cross. According to the 1920 Census of Rumford, Frank was working as a clerk at a cigar and confectionery establishment. By 1930, he was a proprietor. Fred G. Eames was born December 15, 1866 at Newry, Maine, the son of Levi F. Eames and Martha Dunlop (Foster) Eames. Fred, a carpenter, married Carrie I. (Carr) Powers on November 26, 1897 at Rumford, Maine. Carrie, the daughter of Willis F. Carr and Caroline P. (Drew) Carr, was the widow of Edgar Harvey Powers, who had died in 1894. Fred G. Eames became a merchant and farmer. He was appointed Postmaster at Rumford Point, Maine, on August 18, 1902.